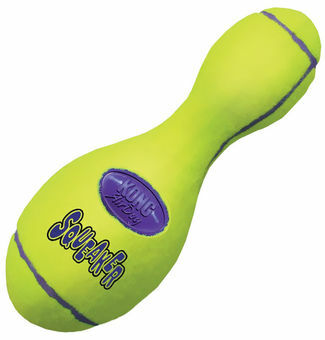 Airdog Kong is the classical two-dog-toy combination of tennis balls and squeaky toys combination, creating a brand new unusually interesting toy dogs toy is izgatavotia from a special non-abrasive tennis ball fabric that will not damage the dog's teeth. All Kong AirDog beeper elements are placed in rubber and covered with fabric norošinot special security. Kong AirDog is not intended for long-term use in water.